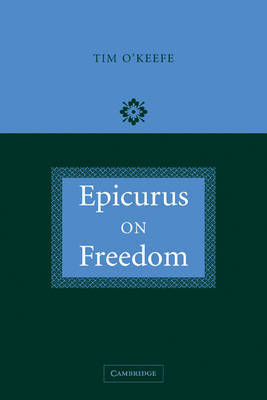 In this 2005 book, Tim O'Keefe reconstructs the theory of freedom of the ancient Greek philosopher Epicurus (341-271/0 BCE). Epicurus' theory has attracted much interest, but our attempts to understand it have been hampered by reading it anachronistically as the discovery of the modern problem of free will and determinism. O'Keefe argues that the sort of freedom which Epicurus wanted to preserve is significantly different from the 'free will' which philosophers debate today, and that in its emphasis on rational action it has much closer affinities with Aristotle's thought than with current preoccupations. His original and provocative book will be of interest to a wide range of readers in Hellenistic philosophy.